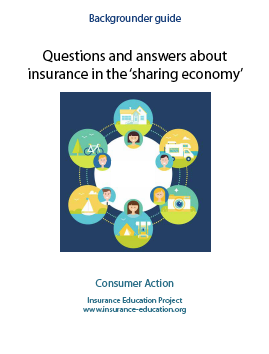 Written in Q&A format, this eight-page backgrounder expounds on the topics covered in the “Insuring Yourself in the 'Sharing Economy'” guide. While there are many advantages to the new peer-to-peer marketplace, those who earn money in the sharing economy—by renting out their car or home, giving rides to paying passengers, making deliveries using their personal vehicle, and hiring themselves out for projects, for example—have to be careful to protect themselves from liability and personal injury or loss. This backgrounder helps answer many questions sharing economy participants may have about their risk exposure and their insurance needs and options. Who needs to be concerned with insurance in the sharing economy? Anyone who could potentially be held liable for property damage, injury or other loss suffered by someone else, or who could suffer injury or loss themselves, should be concerned with how to protect themselves. Essentially, everyone who engages in the sharing economy, but particularly those who earn money through P2P transactions, should consider the worst-case scenario and then take steps to reduce their risk and obtain adequate and appropriate insurance. Why doesn’t my personal insurance policy protect me when I’m engaging in moneymaking pursuits? Personal insurance policies typically do not cover policyholders when they engage in business activities. This is because personal policies are issued and priced (underwritten) based on the level of risk exposure (in other words, the likelihood of being sued). When you engage in business pursuits, your risk exposure typically increases. For example, your odds of getting into a car accident and being sued are much higher if you drive 3,000 miles per month with strangers in your car than if you drive 500 miles per month on your own or with family members and friends. Insurance companies generally are not willing to take on this added risk without charging more for the increased exposure. To be covered, you typically need a policy that is designed and underwritten for the increased risk inherent in business activities. Why doesn’t the company (P2P platform) I earn money through insure me? It might. Many sharing economy companies provide some insurance coverage for those who use their services. Whether any coverage is provided, how much it is, and what is covered or excluded varies from platform to platform. Check the company’s website and/or app for details. But be aware that these protections often contain many more exclusions and stipulations than a policy you purchase would. And because they are voluntary, they can be changed or rescinded at any time. Because these intermediaries typically consider drivers, "taskers" and others who earn money through their platform "independent contractors," not "employees," earners aren’t entitled to the same types of benefits and protections that employees are. So, you most likely won’t qualify for workers compensation should you get injured or sick on the job, or unemployment insurance should your income disappear. Are the insurance policies provided by sharing economy platforms regulated by state insurance departments? According to the National Association of Insurance Commissioners (NAIC), insurance regulators oversee insurance companies and insurance agents, not the sharing economy companies that provide the protection. The best way to find out if the policy provided by the rideshare company is regulated by your state’s department of insurance is to ask the company and/or your state’s insurance department. The NAIC also says that state insurance regulators are working to ensure consumers are adequately covered, with at least 28 states and the District of Columbia having enacted legislation to set insurance coverage rules and standards for rideshare companies. How often can I rent out my home and still be protected under my personal homeowners or renters insurance policy? The only person who can answer that question is your insurer. While some online sources make general statements about some personal homeowners and renters policies possibly covering occasional rentals (i.e., once or twice a year, or a certain number of days a year), there’s no way of knowing if yours would unless you inquire directly. In fact, it’s safest to assume that your insurer would not pay a claim on your personal policy if it were related to the rental of your home. So contact your insurer, discuss your plans (whether you’ll be renting all or part of the home, for how many days per year, etc. ), and go over your insurance requirements and options. It’s best to get your insurer’s answer in writing. If necessary, follow up a phone call with an email summarizing your discussion and ask your insurer to confirm in an email reply or letter. Your insurance cost will most likely go up with the purchase of a different type of policy or an endorsement, but it still might be quite affordable, and will certainly be well worth the protection. Renting out your home without informing your insurance company and purchasing the required type of policy could subject you to cancellation and leave you on the hook for any claim the company denies. Do I have to buy a different type of insurance policy if I rent out a room in my home long-term (roommate situation)? Does the fact that Airbnb provides coverage under its "Host Guarantee Program" mean that I don’t have to buy my own insurance? Not at all! According to Slice, an "insurtech" startup that has launched an on-demand insurance product for homeshare hosts, "The protection Airbnb offers to its hosts is limited, covering only damage caused by a ‘Responsible Guest’—a fraction of the potential damages from a stay gone wrong…. This guarantee is not meant to replace an insurance policy: while it assures hosts that Airbnb will attempt to help them recover damages, it’s meant as a contingent plan, not as a replacement for comprehensive insurance….In fact, Airbnb recommends that all their hosts obtain their own insurance policy that, unlike Airbnb’s guarantee, fully protects their assets and liabilities." What kind of insurance do I need if I rent out my home? The best source of this type of information is your insurer—policy requirements and options will range from company to company and based on your particular activities. Someone renting out their home to travelers might need a rider/endorsement to their homeowners or renters policy, or they could need a business or commercial policy designed for hotels, vacation rentals or bed and breakfasts. You might have the option of a month-to-month homesharing liability policy, but make sure to check limitations and/or exclusions. If you are a landlord—i.e., you rent out property you own full-time to a long-term tenant— you would need a different type of policy (likely a landlord or rental dwelling policy) than someone who rents to numerous guests for short-term stays. I’ve heard that an umbrella policy can help protect me—how do I get one? A personal liability umbrella policy (PLUP) protects your assets from major claims by providing additional liability coverage above and beyond your homeowners and auto policies. It also provides coverage for some risks excluded by other policies, such as false arrest and libel/slander. However, an umbrella policy would not apply if your claim were denied because your underlying homeowners or auto coverage doesn’t cover the incident. So be sure you have the appropriate underlying insurance (commercial vs. personal) and umbrella policy for whatever business activities you engage in. You typically have to purchase your umbrella policy through the company that provides the underlying insurance policy. (In the case of a personal umbrella policy, if you have your home and auto insurance with two different companies, check with both companies to find out their requirements.) The protection is relatively inexpensive and is priced per million dollars of coverage. How do I ensure that my guest doesn’t establish tenancy in my home? There have been cautionary tales of paying guests staying in a host’s home long enough to establish legal tenancy and require that the homeowner go through the time-consuming and expensive legal eviction process to get them out. In many states, approximately 30 consecutive days of occupancy can establish tenant rights, but the exact rules depend on the jurisdiction. A landlord-tenant attorney familiar with your local laws can be very helpful if you want to protect yourself before you rent out your home long-term, or if you have a homeshare guest who has overstayed his or her reservation. TNC stands for transportation network company—the official label used for rideshare companies/platforms. You might see reference to TNCs in insurance regulations or information provided by insurance companies. Do I need a commercial auto insurance policy to drive for Uber or Lyft? That depends on your state—check with your state’s department of insurance. If your state also requires you to have a commercial driver’s license when taking paying passengers, not having one could leave you open to prosecution if you get into an accident, even if you have a commercial auto insurance policy. What happens if I get into an accident while driving for Uber or Lyft? According to The Rideshare Guy, you should provide the rideshare insurance as primary insurance, not your personal policy, if the accident occurs while when you have a passenger or a ride request. During period 1, however, when you are online without an active ride request, Uber and Lyft insurance is primary in some states and contingent in most others, so whether you contact the rideshare company or your own insurance company will depend on where you live. Then you need to contact the rideshare company to get your claim started. After the accident is reported, Uber or Lyft will most likely suspend your account until you can prove your car has no damage, that it is minimal enough as to not affect the customer experience, or that it has been repaired. The Rideshare Guy cautions that if you are going to contact your personal insurance company (i.e., during Period 1 in certain states), they will likely ask you if you are an Uber or Lyft driver (a standard insurance question), and if you haven’t told your insurance company that you are a rideshare driver, you run the risk of your claim being denied and/or your coverage dropped. Even if you wouldn’t have to contact your personal insurance company (because the claim is being handled by Uber or Lyft), they will want to know about any accidents. If you choose not to notify them, you risk being dropped if the company finds out. Attorneys have made a business of advising and defending Uber and Lyft drivers. If you need advice after an accident, you can find a number of such lawyers by doing an online search for keywords such as "uber lyft rideshare accident lawyer" (add your city or town if you prefer a local attorney). The American Bar Association offers general advice for finding a lawyer. Where can I find insurance that covers me while I drive for Uber or Lyft? Because so much is changing so quickly in this area, online lists can become outdated in a very short time. Search for updated results (check the publication date of your source). Or contact companies on your own for the latest offerings. Will TaskRabbit’s liability insurance cover my car accident that happened while I was running an errand for the client? No. While TaskRabbit will compensate up to $1,000,000 for bodily injury or property damage claims by any party involved when the Tasker is negligent during a task, it excludes motor vehicle losses while performing a task. How can I protect myself when earning money as an independent contractor (through TaskRabbit or a similar platform, or on my own)? It’s important to be aware that independent contractors (those who get paid by their clients/customers rather than an employer) have different liability risks than company employees do. Ideally, you should consult with an insurance agent who’s familiar with the type of work you’re doing and can advise you what types and amounts of insurance you need. Many small businesses take out general liability insurance, which can protect you from a variety of claims, including property damage and personal injury, that can arise from your business activities. Learn more at the Insurance Information Institute’s "Commercial General Liability Insurance" page. The best way to ensure that you understand your liability risks, protection needs and insurance options is to consult with one or more insurance professionals. Be specific and honest about what type(s) of work you plan to perform, how often, with what equipment, etc. so that you can get the best advice. How do I find an insurance professional to advise me on my business insurance needs? If you already purchase insurance and are happy with your current company and/or agent/broker, start there. Even if they can’t help you with your business insurance needs, they can probably refer you to someone. Otherwise, read the Insurance Information Institute’s "Finding the Right Insurance Professional for Your Business" to get tips on finding and choosing a business insurance pro. What types of insurance do I need as a maker/seller? You want to protect yourself from liability claims from: buyers who suffer injury or damages caused by your product; loss of business assets (inventory, supplies, tools, office/workshop space, etc. ); and injuries suffered by others on your business property (delivery people, for example). Adding a rider to an existing homeowners or renters insurance policy to protect inventory, supplies and activities on your own property might be an option for some businesses. A separate home business policy might be another option. But it’s very likely that you’d still need a separate product (or general) liability policy to protect yourself against claims brought by customers. Consult with your insurer. FindLaw describes it as "…a manufacturer or seller being held liable for placing a defective product into the hands of a consumer." What kind of protection does product liability insurance provide? Product liability insurance (typically covered under a "general liability policy") protects the policyholder against claims for bodily injury or property damage sustained by a third party due to an issue with the product the policyholder makes and/or sells. The coverage should pay for covered claims, including medical expenses, loss of income, pain and suffering, punitive damages and attorneys’ fees, up to the policy limits. The cost of this type of insurance depends on your business—in other words, how hazardous the product is and how likely it is that there will be liability claims. The insurer will determine what level of risk your business presents and base your premium on that. Where can I buy product/general liability insurance? Read the Insurance Information Institute’s "Finding the Right Insurance Professional for Your Business" to get tips on finding and choosing a business insurance pro. How can I make sure a renter returns my expensive dress/tool/equipment? The platform you use to connect with renters may offer some type of insurance for theft or damage. Read the terms of any coverage provided. Another way to protect yourself—if renting outside of a platform, or if allowed by the platform you use—is to require a security deposit. And be sure to take photos of the item before renting it out so that you have proof of its condition. Also, check ID to make sure you have the renter’s real name and contact information (including license or ID number). To reduce your liability risk, make sure any tools, sports equipment, etc. work properly and are safe. You could be held liable for renting out an item that is known not to work correctly, and a homeowners policy may not cover you because payment was exchanged.